The Nikon Prostaff 4-12x40mm Riflescope is another in a long line of riflescopes designed by Nikon. This scope comes equipped with a bevy of features that will prove useful for hunters of any experience level. The following will provide an in-depth review of the Nikon Prostaff 4-12x40mm Riflescope, including the primary features and pros/cons of the scope. The Nikon Prostaff Riflescope comes with a plethora of useful features. As is implied within the name, the scope offers a wide range of 4 to 12 x magnification and a lens that is measured at 40mm. The optical system that is equipped on the scope allows for 98 percent of light that is available to transmit through the scope so you won’t be blinded by any light glare when lining up the sights. The scope itself is designed in a way that is waterproof and fog-proof, which allows hunting in practically all weather conditions. Another great feature is that of the zero-reset turret that is attached to the scope. This feature provides hunters with the ability to lift the adjustment knob and turn it to zero as a means of resetting the scope. This adjustment knob allows for extremely quick readjustments in the field. The length of the scope is 14.1 inches and allows for a eye relief distance of 3.7 inches. There are a myriad of positive aspects associated with this riflescope. The transmitting of 98 percent of light in the surrounding area provides fantastic brightness even in conditions that aren’t. This becomes really useful during those dark and foggy mornings when you’re looking to get out on the hunt early. The matte black finish of the scope is sleek and goes well with practically all rifles. The field of view provided by the 4 to 12 x magnification is perfect for setting up your shot to even the most minutest of degrees. The field of view at 4x magnification is just over 23 ft. at a distance of 100 yards away, while the 12x magnification level provides a field of view that is just over 7 ft. at a distance of 100 yards away. The scope itself being fog-proof and waterproof is hugely beneficial to those early mornings hunts in fog and heavy amounts of dew. Sighting in general is exceedingly quick and easy to accomplish with this scope and helps dramatically with readjustments that need to be made on the fly. Though there are plenty of positives with this scope, there are a couple of negatives that you should be aware of as well. For one, the crosshairs on the scope can be considered to be slightly too thick to make for precise shots at the maximum magnification, though this isn’t typically that much of an issue. The eye relief is also a bit short for some of the higher magnification levels. Overall, the Nikon Prostaff 4-12x40mm Riflescope is one of the better scopes available at a price of just under $200.00. The clear optics and ability to easily re-adjust the parameters of the sight makes for very simple sighting. Users will also notice that the weather-proofing on the scope is very high quality and allows for hunting in any weather condition. 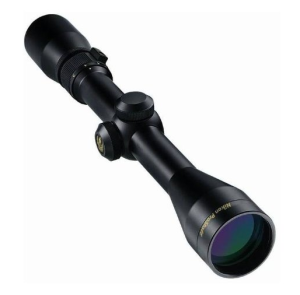 Though there are a couple of negatives associated with the scope, such as short eye relief at higher magnification levels and thick crosshairs at maximum magnification, there are a wealth of positive aspects to the riflescope that make it a scope that is well worth recommending to anyone in the market for one.